A rather unusual choice for a national dish in a country full of eateries serving kababs, koftas and, ahem, grilled pigeons stuffed with rice. There is no "khichdi talk" about it. Kushari is Egypt's national dish. Unequivocally. It is also a rather unusual choice for a national dish in a country that is full of eateries serving kababs, koftas and, ahem, grilled pigeons stuffed with rice. 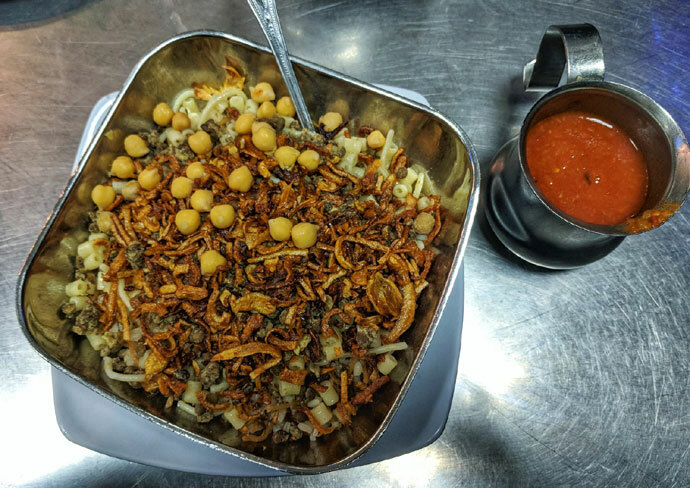 Unlike other popular food items that you may see on a platter in Egypt, kushari is an all-vegetarian preparation. It's as vegan and carb-rich as India's khichdi. That similarity is not accidental. The origins of kushari — some write it as Koshari or Koshary — are shrouded in mystery. 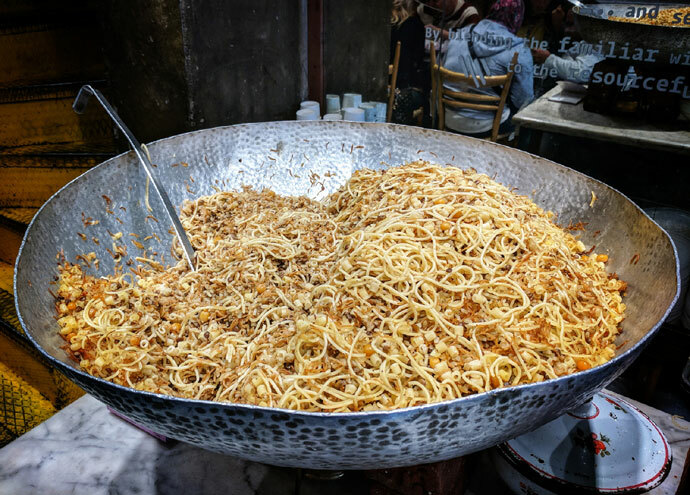 But everyone agrees, from celebrated Egyptian chefs to thousands of ordinary Egyptians who throng hundreds of kushari joints in Cairo daily, that this is a relatively new dish in the country. It started appearing on dinner plates in the beginning of the 20th century in Egypt, and it wasn't until the middle of the century that it became popular. Now, Egyptians can't get enough of it. One story about the kushari's origin — and there are several — links it to India's khichdi. It makes a lot of sense. The name is similar. So are the ingredients and the simplicity of the dish. This story starts around World War I. In those days, Egypt was under the control of the British, who also ruled India. When the great war came to Egypt, Britishers moved many Indian soldiers to the country. It is speculated that these soldiers introduced khichdi to Egypt. Once khichdi entered Egyptian homes and eateries, it underwent a transformation. Although, they are similar — khichdi and kushari — they are different in some significant ways. The biggest difference is in the way kushari and khichdi are cooked. Unlike khichdi, that is prepared with all its ingredients simmering in a pot, all the major ingredients of kushari are cooked separately. They are mixed later, just before the dish is served. Talking of ingredients, it has more than what you will find in your average khichdi. After it reached Egypt, over the years, more ingredients were apparently added to khichdi. It acquired a local flavour. Of these, two were most significant. Kushari, the way it is sold now at the unique and rather famous Koshary Abou Tarek, is a mish-mash of several items. It packs rice, although not the long Indian basmati rice. Kushari is made of the short-grain Egyptian rice, which is stickier and more filling. Pulses are mixed into this rice — similar to what we Indians do with khichdi. But along with the rice and pulses, kushari also comes with a layer of chickpea and a generous mix of macaroni. Chickpea, a popular food item in middle-eastern cuisine, probably came from Egypt whereas the macaroni was an Italian influence. Italy is quite close to Egypt, so it is definitely conceivable that kushari acquired some bits from there. Finally, there is a layer of caramelised onions. This is something we too use in India to garnish rice with; incidentally, caramelised onions over rice has been part of middle-eastern cuisine since forever. All the grain in it makes kushari fulfilling. The crunchy onions lend a sweetness and texture that is unbeatable and the accompanying tomato sauce, chilli chutney and vinegar sauce give it a unique character. One reason why kushari has become the national dish of Egypt is probably because of how palatable, and affordable it is. It is a dish that, just like khichdi, will not offend anyone. Some may find it a little dry, but add some tomato sauce to kushari and you are good to go. In the first half of the 20th century, it was mostly a dish that hawkers would sell on food carts. But its low cost, ease of preparation, ease of eating, and generous portions made it the quintessential dish of the working class. Gradually, it acquired a cult following. Even today it is an inexpensive dish. There are hundreds of joints in Cairo that serve kushari. While some only serve the national dish, every restaurant offering Egyptian cuisine — fancy or hole in the wall — has it on the menu along with fried kofta and kababs. Even at famous joints like Abou Tarek, which serves only kushari and is arguably the best place to get a bowl of filling grain and fried onions in Cairo, the regular portion costs around Rs 50. For a bit more — the medium-sized bowl — you pay 20 Egyptian pounds and for the large bowl, close to 25 Egyptian pounds, taxes included. That is roughly Rs 90. A week ago, when I made my first trip to Cairo, I was looking forward to all the meats all too common in restaurants in the Middle East. Kebabs. Kofta. Grilled meat cubes. Coming back, I realised that I ate more kushari than kababs. As someone who has grown up with khichdi, it was easy for me to fall in love with kushari. It was like homemade food away from home. Tasty and comforting.